When 20th Century Fox announced plans for a biopic about the legendary rock band Queen, with particular focus on its eccentric frontman Freddie Mercury, plenty of people were screaming out "Galileo!" in sheer delight. After replacing Sacha Baron Cohen, who was originally set to portray Mercury but dropped out when he couldn't see eye to eye with the living members of Queen on the over-the-top and debaucherous manner in which he wanted to approach the role, with Mr. Robot actor Rami Malek, Fox unleashed Bohemian Rhapsody onto the masses on November 2. But when the film opened its metaphorical mouth to belt out its songs and stories, it hit a few flat notes. For some, Bohemian Rhapsody was no killer queen, feeling like a bunch of radio ga-ga rather than a rock-and-rolling romp of a musical biopic. 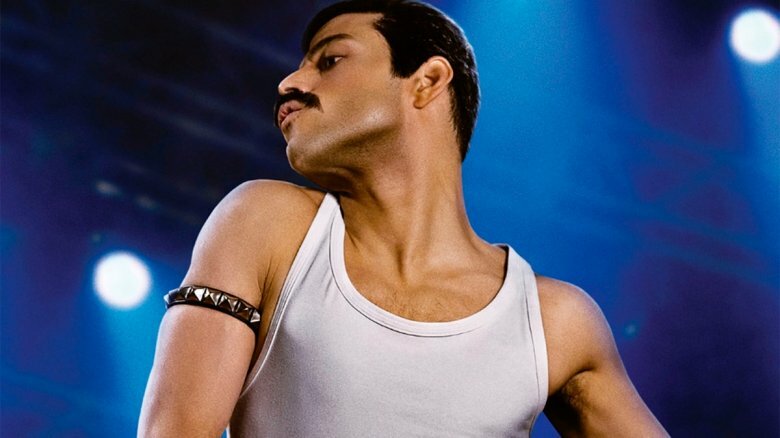 While the majority of viewers enjoyed Bohemian Rhapsody well enough — taking it as not a great film but at least an entertaining one, and giving lead actor Malek a proverbial standing ovation for his "transcendent and beyond Oscar-worthy" performance — plenty of critics published brutal reviews of the film. Here's just a taste of the harshest responses to Bohemian Rhapsody. 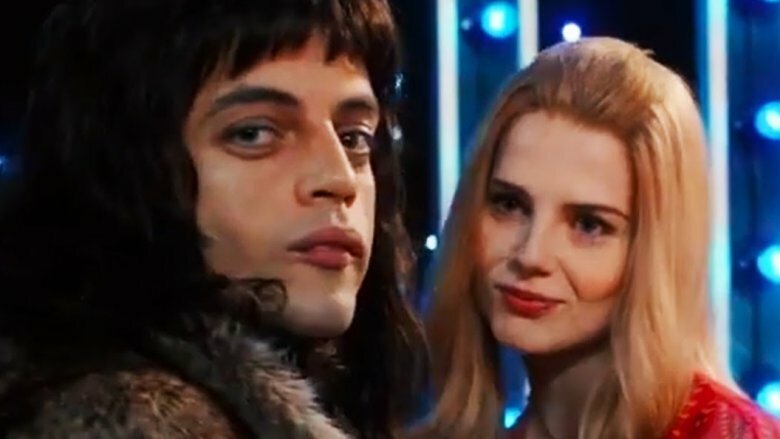 IndieWire's Dave Erlich argued that not even Malek's "spirited" performance as Mercury could save director Bryan Singer's "royally embarrassing," "broad, frivolous, and uselessly formulaic" Queen biopic. "If not for Rami Malek's feral posturing as one of rock history's greatest frontmen, a deep roster of killer songs, and the long shadow of his band's iconic 1985 performance at Live Aid, this movie could effectively be about any musicians, at any time, rolling through any part of the United States. From the disapproving parents, to the drug-fueled orgies, to the unbelievable scene when a young Freddie Mercury (née Farrokh Bulsara) introduces himself to Brian May and Roger Taylor mere seconds after the two bandmates have been abandoned by their original lead singer, it's an out-of-body experience to watch such a paint-by-numbers portrait in a post-Walk Hard world," wrote Erlich. "If there's anything more tiresome than the movies that inspired the Dewey Cox story, it's a movie that uses Jake Kasdan's damning parody as a template. Even when it's funny, Bohemian Rhapsody isn't in on the joke — it's too busy burnishing its own myth." Rafer Guzmán of Newsday mentioned Kasdan's biopic parody Walk Hard in his review as well, writing that Bohemian Rhapsody is exactly the type of movie that should never have happened after Walk Hard's release. "The story of a charismatic rock star living at the peak of rock history — the mid-1970s — Bohemian Rhapsody comes built-in with a headbanging soundtrack, 20 years' worth of costume changes and, in true rock fashion, a tragically early death (Mercury died at the age of 45, from complications of AIDS). By rights, this ought to be a glammed-up, sexually-charged, four-octave blowout. Instead, it's a stilted, stagy, hopelessly corny biopic, the kind of thing Walk Hard was meant to prevent," wrote Guzmán. The New Yorker's Anthony Lane also got a parody vibe from Bohemian Rhapsody. "As a film, Bohemian Rhapsody is all over the place," Lane typed out. "The later sections of the story, dealing with Mercury's AIDS diagnosis, are carefully handled, but most of the film is stuffed with lumps of cheesy rock-speak ('We're just not thinking big enough'; 'I won't compromise my vision'), and gives off the delicious aroma of parody." Mike Ryan of Uproxx didn't have much praise for Bohemian Rhapsody either, comparing the biopic to a game of "dirty pool" in his review. "Either one of the next two things are true: Either the surviving members of Queen still resent the fact that so much of their legacy is wrapped up in Freddie Mercury that they had to make this revisionist history of a movie, or the surviving members are so cinematically tone deaf they inadvertently made a movie that sure comes off like that's what they were trying to do," Ryan said. "To now retcon [Mercury's] illness into his Live Aid performance seems flippant and cruel. But that's the nature of this movie, to reposition and recast Freddie's life as how the rest of the band members seemed fit to do. I have no idea if it was malicious — probably, consciously, it wasn't — but regardless, this is the end result: to punish Freddie Mercury 27 years after his death. And, without the surviving band members' permission, this movie couldn't use Queen's music. In hindsight, it would be better if this movie didn't exist at all." Kimber Myers, a critic at The Playlist, felt that Bohemian Rhapsody was "embarrassingly unprepared to cover the life of its subject," and because of that, the film couldn't stop itself from becoming a "jumbled take on the legend" that's "squawky, sexless, and shallow, assaulting the senses as it offers little insight or real depth into Mercury or the band he fronted." Myers continued, "Bohemian Rhapsody takes the medley approach to the musician's biography, changing songs abruptly — literally and figuratively – in each moment it starts to get interesting. Even the iconic Live Aid concert gets the radio edit treatment, giving the audience only a sampling of the man and the band's full spectrum of genius," before concluding that the film "is as intimate as a sold-out stadium show, with none of the accompanying power" and marking it with a D+ grade. Little White Lies' Hannah Woodhead wrote that, while Malek is "perhaps the best version of Freddie we could hope for," the late, great frontman deserved more than Bohemian Rhapsody: "It's nowhere near as interesting or absorbing as its central figure, and in glossing over the elements of Mercury's identity and life which are so vital and important to many – his race, sexuality, and the fact he was the first major rock star to die of AIDS — Bohemian Rhapsody leaves a sour taste. This is a revisionist attempt at painting Mercury in primary colors suitable for audiences who'd rather just bop along to the Greatest Hits than think about the man who shared his gift with the world until it killed him, and Freddie deserves so much more." Roger Ebert's Sheila O'Malley too stamped Bohemian Rhapsody as a stinker, and found fault with the film's hesitancy to properly portray Mercury's queerness. "Bohemian Rhapsody is bad in the way a lot of biopics are bad: it's superficial, it avoids complexity, and the narrative has a connect-the-dots quality. This kind of badness, while annoying, is relatively benign," she wrote. "However, the attitude towards Mercury's sexual expression is the opposite of benign. The tensions of being a gay man in the 1970s are not handled, or even addressed … There's no other word for this approach than phobic." But it was The New York Times critic A.O. Scott whose review fired lethal shots at the film. "Bohemian Rhapsody, the movie about Queen, lasts more than two hours, not a very long time by modern feature standards, even though it feels interminable. A baroque blend of gibberish, mysticism and melodrama, the film seems engineered to be as unmemorable as possible, with the exception of the prosthetic teeth worn by the lead actor, Rami Malek, who plays Freddie Mercury, Queen's lead singer. Those choppers may give you nightmares," Scott said. "And some of you who venture into the theater will surely be inspired to exclaim 'Mama mia, let me go!'" Although not everyone was rocked by the film, it's sort of a miracle that Bohemian Rhapsody made it to screens at all. The biopic hit a huge snag in the road to release when Singer was fired after his "unexpected unavailability" due to a "personal health matter" — as well as the "growing tension" between Singer and Malek that reportedly came to a head when Singer allegedly threw an object in Malek's general direction – forced the production into hiatus and spurred Fox to tap Dexter Fletcher as Singer's replacement. Long before that happened, Singer was said to have skipped out on entire days of shooting, leaving cinematographer Thomas Newton Sigel to step in and take over his duties. Actor Tom Hollander, who plays Queen band manager Jim Beach, even reportedly briefly quit the movie due to Singer's behavior. Following Singer's firing, one source stated that the director was "suffering from post-traumatic stress disorder" due to the animosity, hostility, and tension on the set of the film. It goes without saying that these reviews are just a handful of the harshest responses to Bohemian Rhapsody. As with all movies — not just biopics about iconic bands and their lead vocalists — some people dug Bohemian Rhapsody and others flat-out hated it. Such is life, and as Queen themselves say, the show must go on.